During the Fall season, it is clear that all of the oak trees around us are producing acorns by the hundreds and dropping them down to scatter their huge understory. This makes for an abundant resource for food as long as you can take the time to collect and prepare them. Collecting acorns works best by either picking them from the tree, shaking the branches for freshly ripened acorns, or scouring the same understory of some oaks to ensure they were newly fallen (so to avoid the tiny hole from the larva of the oak weevil). Newly sprouted acorns (less than 2 inches) also indicate they are good to use. There are over 20 species of oak native to California, with a few being local to San Luis Obispo county. They grow in various climates with a variety of leaf designs and acorn sizes and tannin volume. 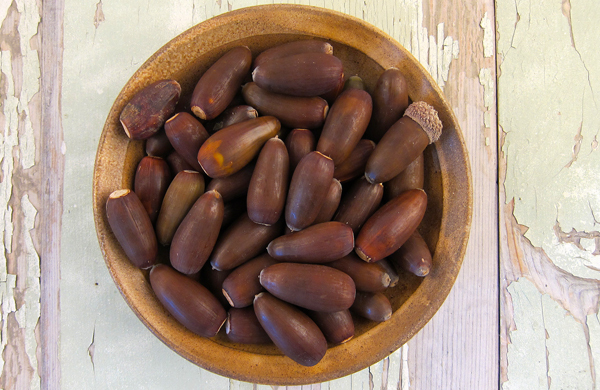 Different oaks produce varying size and flavor of acorns, but are all generally harvestable and edible. If you are interested in being a part of any acorn harvesting, propagation, and flour making events, contact the SLO Permaculture Guild at slopermaculture@gmail.com and “like” their Facebook page to be informed about upcoming acorn events. Crack your acorns into a bucket of water, then extract them from the shells into a large bowl of water. Keeping the nuts under water helps preserve the light color—acorns oxidize and turn dark easily. One good trick is to freeze the fresh acorns before cracking, and then cracking the shells afterwards and putting the nutmeats into cold water. Fill a blender half full with acorns and cover with fresh water. Buzz them until you have what really looks like a coffee milkshake. Pour the mix into large jars (big Korean kimchee jars are great) about halfway and top off with more water. Seal the jar and shake everything up. Put the jar in the fridge. Every day, pour off the water, replace with fresh water, shake well, and set back in the fridge. You're done when the acorns no longer taste bitter (The blue oaks took a week). Now you need to dry your flour. Start by pouring everything into a colander with cheesecloth set in it. Gather the cheesecloth and squeeze it tight to extract as much water as you can. Now spread the still-damp flour on a large rimmed cookie sheet. Break up any clumps. Blue oaks have a lot of oil in them, and you will get "acorn butter," a very light, clay-like substance that you can skim off or incorporate into the flour. I mix it in, as it has a lot of flavor. Acorn butter clumps a lot, so you will need to break it up well. Now you need to dry the acorns. You can do so by putting it through a dehydrator, laying the flour on a cookie sheet and leaving out in the bright sun, or putting the cookie sheet in an oven set on "warm”, or about 200 degrees. Don't get the heat much higher than that, or you will bake your flour, and you don't want that. Finally, you need to grind the dried flour one more time. Use a heavy duty coffee or spice grinder. Grind the flour into a fine powder, which took me about 35 seconds. Store in the fridge or freezer, as the fats in acorn flour go rancid rapidly. Sift the flours and salt together in a large bowl and make a well in the center. Add the olive oil and water in the center of the well and swirl to combine with a finger or two. When the dough gets shaggy, start bringing it together with your hands, then knead it on a floured surface for 5-8 minutes. Use a bit more flour if it is too loose. Lightly coat with more olive oil, wrap in plastic and set aside for at least an hour. This dough can hold in the fridge for a day. Take the dough out of the fridge if you’ve put it in there and let it warm to room temperature. Get a griddle or a well-oiled cast iron pan hot over medium heat. Cut the dough into equal parts; I’d suggest between 6-8. Roll them out one at a time with a roller and then your hands – they need not be perfect, as this is a rustic bread. You want them thin, though, about 1/8 inch. Lightly oil the griddle and cook the piadine one or two at a time for 2-3 minutes, or until it begins to get nice and brown. Flip and cook for another 1-2 minutes. Keep them warm in towels while you make the rest. Serve with some cheese, fresh herbs – green onions are excellent with this – and some high-quality olive oil. Mix the acorn flour, wheat flour, baking soda and powder and salt in a bowl. In the bowl of a stand mixer, or in another large bowl, beat the egg yolks, oil, honey and 2 tablespoons of sugar together until it looks like caramel. Mix in the dry ingredients. Fold this into the dough a little at a time gently. Pour, or really gently place, the dough into the ramekins (remember they will rise!) or the springform pan. Using a rubber spatula flatten out the top and place in the oven as fast as you can.